In Memoriam: Toy Savage, Jr.
They’re easy to miss, buried on page three of his curriculum vitae. The Hon. Ralph Northam, MD, Virginia’s new governor, needs to update his CV. Maybe it’s his Eastern Shore roots. The son of a judge and a nurse, Gov. Northam grew up on a small farm in Onancock. He graduated with distinction from Virginia Military Institute, and in 1984, he earned his medical degree at EVMS. Back then, Gov. 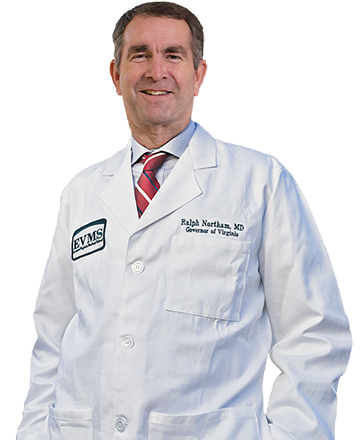 Northam shared an apartment with fellow medical student John “Rob” Marsh, MD (MD ’83), the highly decorated military physician portrayed in the movie Black Hawk Down. Dr. Marsh, once named national Country Doctor of the Year, now splits his practice between two rural communities in Virginia’s Shenandoah Valley. But politics — let alone living in that particular residence — wasn’t part of his plan. After graduating from EVMS, Gov. Northam served for eight years as a U.S. Army physician, completing his residency in Texas before treating soldiers injured in Desert Storm. When he returned to Hampton Roads, he co-founded a pediatric neurology practice and joined EVMS as Assistant Professor of Pediatrics. Gov Northam is on a leave of absence from EVMS but says he might be back after his four years in Richmond. Her husband won his state senate seat by a wide margin and was re-elected easily in 2011. In 2013, he ran for lieutenant governor and again won handily. Shifting his focus from caring for patients to caring for citizens was a natural transition, Ms. Northam says. In 2016, Gov. Northam took a leave of absence from teaching and practicing medicine to campaign for governor. With his win, his leave continues. But that hasn’t changed Nancy Stern’s view of him. 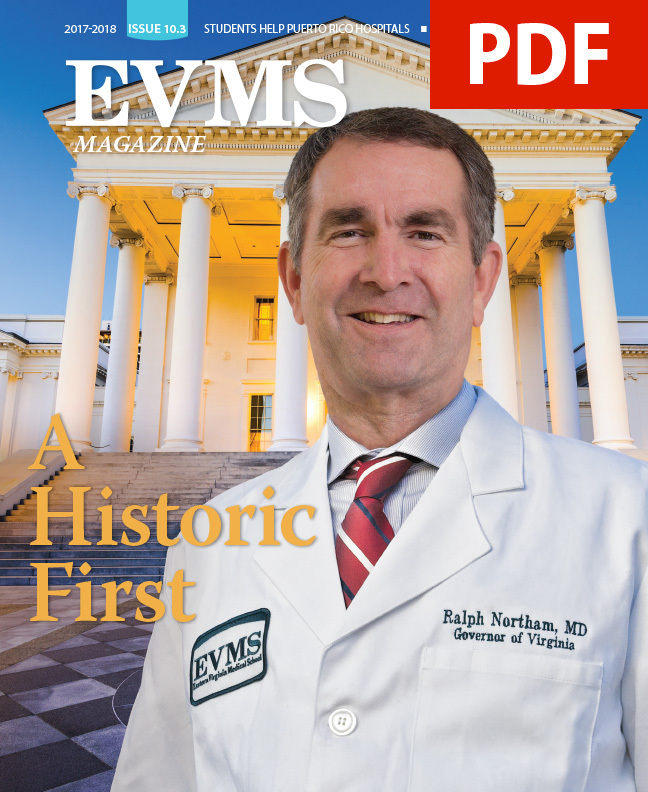 Ten days after the election, EVMS sat down with Virginia’s new governor (who asked us to “please, call me Ralph”) to talk about how his background as a physician will shape the way he leads the commonwealth. What follows are excerpts from that interview. 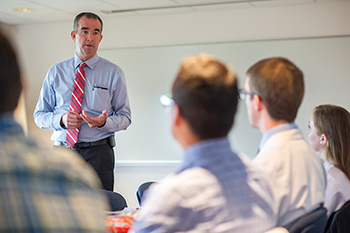 How will your background as a physician shape the way you lead Virginia? In the same respect, how will your Eastern Shore roots affect your focus as governor? When you attended VMI, you wanted to be a fighter pilot. How did you get from fighter pilot to pediatric neurologist? What are the biggest challenges you face as governor? You’re well known for working across the aisle. In today’s polarized climate, how can you be successful in bringing that approach to governing Virginia? What are the health-related initiatives you would like to pursue? You’ve experienced EVMS three different ways: as a student, as a parent and as a faculty member. What has each of those roles shown you about the school? As governor, will you still see any patients or do any teaching? You worked with Edmarc Hospice for Children for many years? You’ve been described as having a bit of a competitive streak. How has that manifested in your work? When it comes to good health, do you consider yourself a role model? Your daughter is a web developer in Richmond. So you’ll get to see her now on a regular basis? As lieutenant governor, you led the Governor’s Task Force on Improving Mental Health and Crisis Response. Why was that important to you?